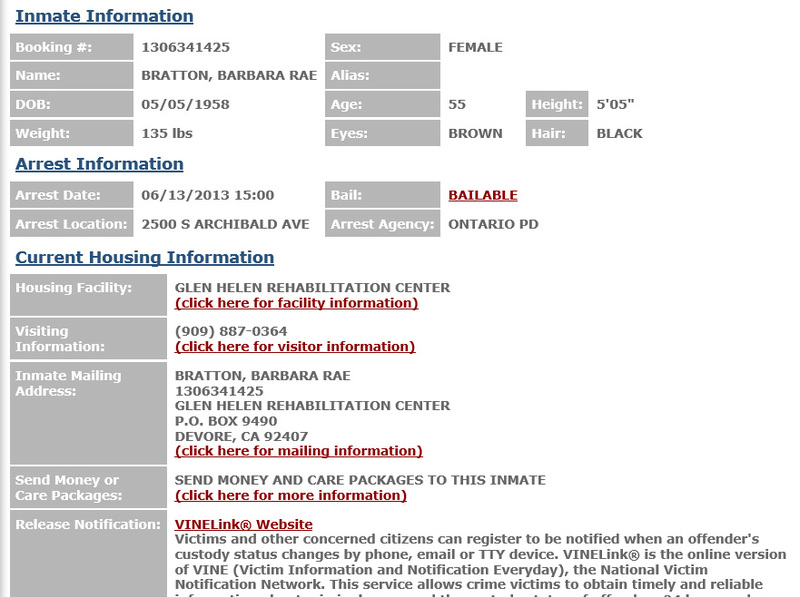 So Barbara Bratton is currently in solitary confinement in the Glen Helen detention center in Devore, CA. Apparently she’s being held for filing two documents on April 11, 2013, with two separate criminal counts being leveled against her for each of the two documents: 1) a “Correction of Grant Deed” for which she is being charged both with forgery and “procuring and offering false or forged document,” and 2) a Warranty Deed for which she is being charged for the same two counts above. She is also accused of “second degree burglary” supposedly because she entered the office of the San Bernardino County Recorder with “intent to commit larceny and any felony.” So that’s 5 counts total against Bratton. Isn’t that what banks do? “…documents prepared by DocX and filed in Michigan were reviewed. DocX processed mortgage assignments and lien releases for residential lenders and servicers nationwide. The investigation revealed that former DocX president Lorraine Brown allegedly orchestrated a widespread scheme in which employees were directed to forge signatures on mortgage documents in order to execute these documents as quickly as possible, producing increased profits for DocX. Internally, DocX identified this practice as facsimile signing or surrogate signing. The investigation revealed that more than 1,000 unauthorized and improperly executed documents were filed with county registers of deeds throughout Michigan. (d) failed to sufficiently oversee outside counsel and other third-party providers handling foreclosure-related services. (3) By reason of the conduct set forth above, the Bank engaged in unsafe or unsound banking practices. Now, how is that substantively different from what Bratton did? It isn’t of course, but we don’t see the San Bernardino legal eagles branding U.S. Bank as “domestic terrorists” or “paper terrorists.” Why not? After all, if U.S. Bank engaged in substantively the same behavior as Barbara Bratton, does not U.S. Bank deserve to be disgraced with the same label as Barbara Bratton? And that’s the problem–no judge or district attorney seems willing to label the banks as “terrorists” even when the banks engage in what those same judges or district attorneys would readily call “paper terrorism” if a private citizen did it. It’s a distinction without a difference, i.e. the same behavior is considered A-OK if banks do it but it’s punishable by solitary confinement if a private citizen does it. I want to be clear that I am in no way arguing that because U.S. Bank may be a “paper terrorist,” then that means that Barbara Bratton is a paper terrorist–I believe the exact opposite is true. Indeed, the truth is the ultimate defense. So the truth needs to be determined, namely: who is entitled to the house, Bratton or U.S. Bank? As the consent order with U.S. Bank makes abundantly clear, along with the general fact pattern of the ongoing foreclosure crisis, there is more than enough evidence to come down in favor of Bratton. So if Bratton is in fact the true owner of her property, then that necessarily means the following: the documents she filed are not forgeries but the documents that U.S. Bank filed are forgeries, and should be treated as such. Bratton filed suit against U.S. Bank to determine who the true owner is. From a cursory glance over some of the documents in that case, one can see that Bratton was not allowed to conduct any discovery in her case because Judge Dale S. Fischer (who interestingly presided over the Pellicano celebrity wiretapping case) ended the case on the motion to dismiss of U.S. Bank and its co-defendants. This is of course, a very typical result, and obviously serves the purpose of suppressing the truth of who is entitled to Bratton’s house. It’s the perennial tale of the non-judicial foreclosure process–the party who is forced to bear the burden of proof in such a lawsuit (i.e, the homeowner) is not allowed to compel the party holding all the evidence (i.e., the bank) to produce any of that evidence. Then the judge says the homeowner is merely making baseless legal conclusions and has no chance to prevail. However, since Bratton filed her suit as a pro se litigant, Judge Fischer was precedent-bound to construe Bratton’s pleadings more liberally than those of U.S. Bank as well as FRCP-bound to consider the motion to dismiss in the light most favorable to Bratton. Without having read the motions to dismiss or Bratton’s response(s) to them, one can safely conclude that the judge did neither of those things. Again, that would be par for the course. So how has it come to this? Yes, we have arrived at a place most decent Americans never imagined we’d come to–where big corporations and banks can, with essentially absolute impunity, perpetrate acts which are considered felonies (and treated as such) if private, decent Americans perform the same acts. Even if the private, decent Americans are in the right. This entry was posted in Foreclosure, Police State and tagged Barbara Bratton, california, consent orders, DocX, fascism, FBI, foreclosure fraud, Glen Helen, Lorraine Brown, LPS, OCC, Occupy, Occupy Wall Street, paper terrorism, San Bernardino, U.S. Bank. Bookmark the permalink.